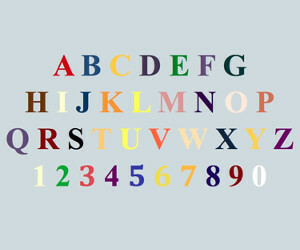 The association of specific colors with each numerical digit or letter is called grapheme synesthesia. Synesthesia can be referred to a medical condition where the stimulation of one sense causes the perception of another. Due to lack of proper testing tools and procedures, estimates of the number of synesthetes have been set ranging from between 1 in 200 people to 1 in 10000 people. Studies show that there are some similarities on how the synesthetes' stimulus reactions affect their color perception of letters or numbers. For instance, it is reported that letter "A" is associated with the color red. However, these still remain speculations because more research is yet to verify this claim. Unlike the more evident and visible physical conditions such as ulcers and bone fractures, diagnosing grapheme synesthesia in which individuals have a mental representation of colors of letters and colors of numbers may at first seem to be an impossible task. However, objective tests have been developed to effectively diagnose this type of synesthesis which is one of the most common forms of synesthesis and one of the most studied owing to the extensive knowledge about the visual system. Over the years, a number of features of synesthesia have been outlined. Such features include the involuntary natures of the synesthetes. They have no control over the sensation. The sensations are usually passive and they usually occur in the presence of a specific stimulus such as an object whose visual representation stimulates memories and sensations of a particular color. For example, one can involuntarily associate the letter "G" with a mental visual perception of the color green. Another characteristic of this association is that the sensation is usually simple and objective. It does not consist of sophisticated imaginations but rather of geometric patterns or a color of a letter. This feature supports the reason why synesthetes exhibit enhanced memory. This is due to the fact that they can use the colors of numbers to remember a long sequence of numbers. This memory is also a distinguishing and diagnostic feature. For instance, the person can remember the synesthete color attribute of a word, a person or an object better that the name of the individual, word or the object itself. Research suggests that most synesthetes develop this condition as a result of pairing more frequent colors with more frequent letters. It is also a common belief that this type of synesthesia is based on general rules. For example, the word "G" being green can drive most synesthetes association. A closer look at the brains of grapheme-color synesthetes also reveals that they have more grey matter in their left caudal intraparietal sulcus and the right fusiform gyrus. Even more, most significant brain differences are found in areas dealing with letter, word and color processing such as the V4a. Although it is not prove, these variations could be the reason for the presence of grapheme synesthesia.